Are you reading this website on its "home" page at www.UnreasonableMan.net or are you getting some sort of a feed into your own information channel? Did you get here by chance or did you try typing the word "unreasonable" into Google? 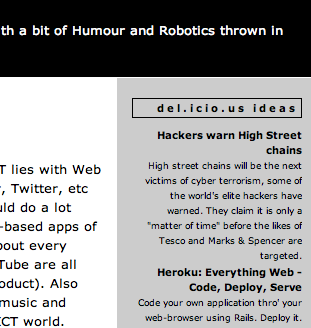 Are you reading the comments on the right hand side of the page ("del.icio.us ideas") or just the main entries down the middle of the page? If you're reading this in some sort of feed reader then do you have the latest feed: http://feeds.feedburner.com/TheUnreasonableMan or are you reading something quite different (and perhaps older)?